Commandment’s of God, commandments of men – I Am Not Ashamed Of The Gospel Of Christ! 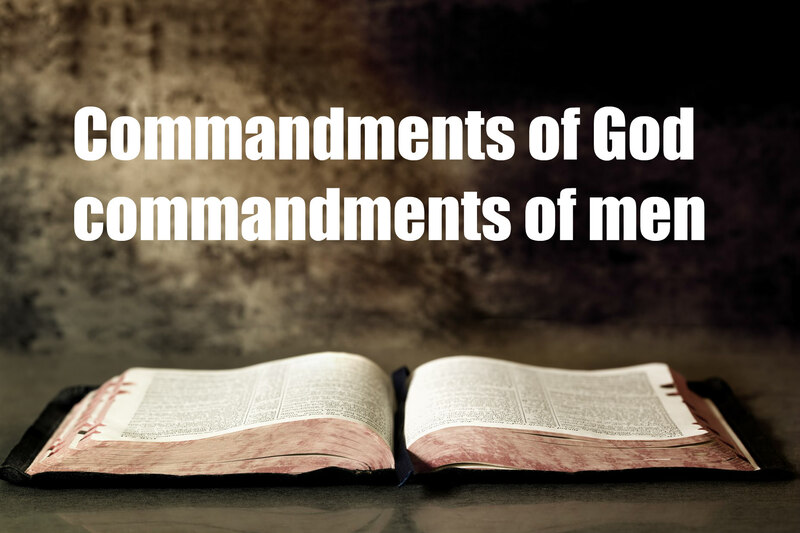 The commandment’s of men are far different from the commandment’s of God,in fact Jesus said how following mans tradition and commandment’s causes people to serve Him in vain therein making Gods commandment’s non effective! (Matthew 15:1-9). Then came to Jesus scribes and Pharisees, which were of Jerusalem, saying,2 Why do thy disciples transgress the tradition of the elders? for they wash not their hands when they eat bread.3 But he answered and said unto them, Why do ye also transgress the commandment of God by your tradition?4 For God commanded, saying, Honour thy father and mother: and, He that curseth father or mother, let him die the death.5 But ye say, Whosoever shall say to his father or his mother, It is a gift, by whatsoever thou mightest be profited by me;6 And honour not his father or his mother, he shall be free. Thus have ye made the commandment of God of none effect by your tradition.7 Ye hypocrites, well did Esaias prophesy of you, saying,8 This people draweth nigh unto me with their mouth, and honoureth me with their lips; but their heart is far from me.9 But in vain they do worship me, teaching for doctrines the commandments of men. Early in scripture we are given the commandment’s set forth for man to abide by,and we learn that there is mercy shown to those who love and keep His commadment’s.For those who hate Gods righteous ways they will be visited for choosing iniquity over what is right (Exodus 20:5-6). 5 Thou shalt not bow down thyself to them, nor serve them: for I the Lord thy God am a jealous God, visiting the iniquity of the fathers upon the children unto the third and fourth generation of them that hate me;6 And shewing mercy unto thousands of them that love me, and keep my commandments. While the world will without reservation follow after and worship the beast by receiving his mark, it will be in the patience of God’s people who keep His commandments and faith in Christ that will inherit the Kingdom! (Revelation 14:9-13). 9 And the third angel followed them, saying with a loud voice, If any man worship the beast and his image, and receive his mark in his forehead, or in his hand,10 The same shall drink of the wine of the wrath of God, which is poured out without mixture into the cup of his indignation; and he shall be tormented with fire and brimstone in the presence of the holy angels, and in the presence of the Lamb:11 And the smoke of their torment ascendeth up for ever and ever: and they have no rest day nor night, who worship the beast and his image, and whosoever receiveth the mark of his name.12 Here is the patience of the saints: here are they that keep the commandments of God, and the faith of Jesus.13 And I heard a voice from heaven saying unto me, Write, Blessed are the dead which die in the Lord from henceforth: Yea, saith the Spirit, that they may rest from their labours; and their works do follow them. futuret….Yes! Prophecy is unfolding right before our eyes.God Bless You. I AM NOT ASHAMED OF THE GOSPEL OF CHRIST EITHER. THIS WORLD IS MELTING AND BIBLE PROPHECY IS BEING FULFILLED EVERYDAY.